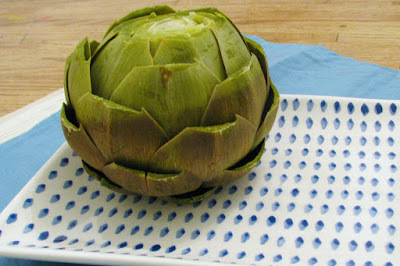 Jessi from Shrinky-dinky.com asked me the other day how I cook artichokes, and since I eat them so regularly, I thought I'd share it with all of you. Artichokes rock. They are a great food, take forever to eat and are delicious. To prepare, I take one artichoke, cut off most of the stem (leave about an inch near the leaves of the artichoke) and I cut off the tip. Then I take kitchen shears and cut off the top of each and every leaf. I usually just rip off the itty bitty leaves near the stem. I rinse out the artichoke and put it in a bowl of water and lemon juice, usually there is enough water to mostly cover the artichoke, but not so much that it starts floating. I then pop it in the microwave for 5-8 minutes, depending on the size of the artichoke and the microwave. When done the leaves should be easy to peal off. It will need to sit to cool down. I serve it with I Can't Believe It's Not Butter Spray. I spray leaves as I eat them and when the leaves start getting translucent and I get close to the choke(hairs that are attached the the heart of the artichoke), I start throwing them away and then I cut off the choke (terrified of actually being choked!) and I wipe it down with a paper towel to make sure there is no choke left. Once it's clean I spray away and eat the heart.